Stanford head coach John Dunning likes using 3 on 3 play in his practices. He sees it as an opportunity to highlight specific skills the team needs to improve upon. In this video, the team focuses on setting. Repetitions only count if the sets are both accurate and the correct height. As the drill progresses, the coach can add variations to increase the level of difficulty. 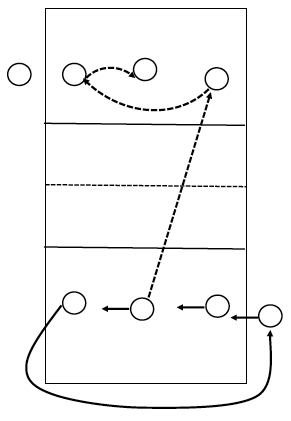 Variations could include two contacts per side, only overhand digging, hitting at setters (so non-setters handle the second ball), and approaching with a jump to hit. Additionally, the drill can change from cooperative to competitive play.